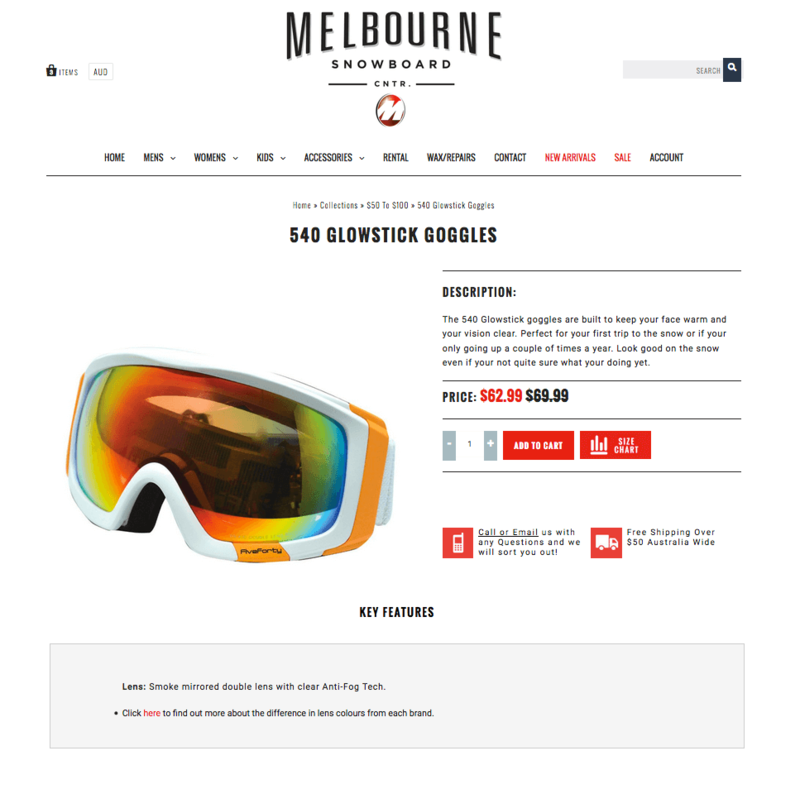 Melbourne Snowboard Centre was started in 1996 with the desire to bring the love of the mountains to the city of Melbourne. Since then, they’ve been providing the best equipment for snowboarders and skiers alike, with fantastic service and a strong reputation in the industry. A comprehensive, beautiful homepage that allows the team to showcase latest products, featured specials, blog posts and more. A collections page with lots of special effects: Banners such as “Sale”, detailed filters on the left to help customers narrow down their selection, and a beautiful layout that shows prices and ‘specials’ whilst still working smoothly on all devices. A detailed product page with size guide, clear call to action (add to cart button), contact information, shipping information as well as room for not one, but two sections of description to showcase all the products’ details. "My experience with Tristan and Shopify Ninjas has been nothing less than extraordinary. Great communication, super friendly, easy to deal with and very understanding. After 3 other attempts at using different web developers and only getting 80% or less of what was promised it was so refreshing to work with someone who was upfront and honest about exactly what could be done and super helpful with finding workarounds when something wasn't directly possible. I cannot recommend Tristan and his team enough. "